Chiayi is a small city about 1 ¾ hours by High Speed Rail from Taipei. The prison dates from Japanese colonial rule and was in operation from 1922 until 1994. It opened as a museum in 2011. It is a relatively small prison compared to places like Abashiri in Hokkaido so there is less of a sense of the space constituting a whole infrastructure and community. Few objects relating to the prison have been conserved and so far objects on display are found in glass cabinets rather than used to ‘reconstruct’ scenes from prison life. Everything except the toilet and no smoking signs is in Mandarin only which makes it hard for non-Mandarin speakers to form any real sense of the types of narratives being presented either by the tour guide or the information panels. What this does mean, at least for me, is that this offers an opportunity to experience the space of the prison and think about the organization of objects in themselves rather than framed by the information and anecdotes provided by a guide or by information placards. It also gave me the chance to think some more about the dynamics of the tour itself. The compact size of the prison and its architecture (based on a radial prison model with a central control station) – low ceilings and small reception rooms (which must have originally functioned as offices and processing rooms) – meant that a guided tour seems crowded and precludes any possibility of spending time looking and thinking about what’s on display. Ultimately, we decided to explore the rooms once the tour had moved on but were hurried out of the prison once the tour had ended so they could close. Elsewhere, such exploration is not possible due to security measures or the arrival of the next tour group. Unlike many of the prison museums we’ve visited, entrance to the museum and the tour was free. There was also no souvenir shop. However, tours take place at specific times and you can only access the prison for the tour. In opting to leave the tour behind (or in front) there is always a risk that despite being free to explore the space independent of the guide’s narrative, such exploration will depend instead on personal preconceptions and the desire to see certain things. This is no less true of an academic visiting a prison museum than it is of any visitor and calls to mind Michelle’s Browns assertion in The Culture of Punishment (2009) of the need for rigorous auto-critique when analyzing the role of cultural representations of incarceration on public perceptions of criminality and punishment. The first rooms we visited as dictated by both the architecture of the prison and structure of the tour, focused on the prison administration and the officials involved in preserving and reopening the site thus emphasizing the relationship between the prison as social institution and the prison as cultural institution in the form of museum via extensive photo displays of past and recent dignitaries alongside those of prison wardens and officials. Such displays leave no doubt as to the overriding ideology of the museum as a commemoration of the state justice system. The central control station and the three corridors of prison cells based on a radial model, are completely absent of prisoner narratives. Prison uniforms for both guards and innmates are displayed on dressmaker’s dummies rather than mannequins precluding even the crudest possibility for human identification. A range of weapons, shackles and even a crucifix-like device are on display but there is little in the way of artifacts which attest to the daily running of the prison such as cooking and eating utensils which feature extensively in other museums especially Abashiri and also the Jing-mei Human Rights Memorial and Cultural Park in Taipei. The prison cells are all empty except for a Western-style toilet which takes up over a quarter of the space but, interestingly, a framed photograph has been attached to many of the doors. These photographs are old images of the prison architecture, mainly taken from outside the prison. The link between social and cultural institution continues later on in the tour through extensive displays, in glass cabinets, of prisoner art and objects produced by inmates. A large portion of the prison is taken up with three halls which were once factory buildings where inmate labour took place. The first hall was taken up with large sculptures often made from papier mâché and preserved behind large glass cabinets. The second hall featured smaller models and ceramics alongside agricultural artefacts and old forms of technology either preserved from the prison or produced by inmate labour. At the back of the second hall were two more recent installations – artist interpretations of prison cells confusing the more straightforward presentation of art and production as rehabilitation and repayment of social debt. 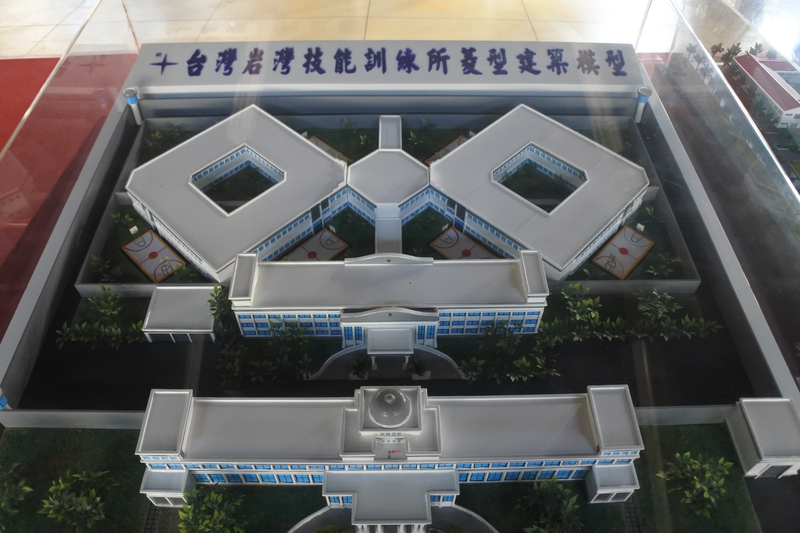 The third hall featured approximately twenty scale models of Taiwan’s prisons and detention centres. Where some were based on the celebrated radial model, others take a form similar to military barracks or hospital. The divergence of the models attests therefore to the prison not as a homogeneous structure based on a single model or ideology but, rather, as an institution perpetually at the centre of contemporary urban planning and public consciousness even when its material existence has been pushed beyond the outskirts of towns and cities. While I am usually wary of appropriating Michel Foucault’s comment that ‘Quoi d’étonnant si la prison ressemble aux usines, aux écoles, aux casernes, aux hôpitaux, qui tous ressemblent aux prisons?’ which referred specifically to 19th century forms of institutional architecture and power, here, it seems particularly pertinent precisely because of its multiple and diffuse forms. Such models with their painstaking attention to detail, it transpires, were made by inmates which pushes the question of the role of inmate art and labour. What is at stake in recreating in miniature the very space and structure which confines you? Does this exacerbate the claustrophobia as the space literally gets smaller producing a mise-en-abîme which denies any possibility of escaping. Or does it shift the perspective outwards and upwards, providing the chance to see the prison from outside and above, offering a control over this space? There is no way of knowing since such displays are devoid of any narrative from the inmates that produced the models. The finished object stands as a double affirmation of the success of the Taiwanese prison system as it adopts different architectural models and co-opts its inmates in their museification whilst subsuming and indeed effacing the voice and identity of those incarcerated. Likewise, around the edges of the hall were relics of old pieces of prison architecture such as coving affirming the way in which a history of architecture is privileged above a history of punishment and is often used to legitimize the preservation and restoration of carceral spaces both as museums and for other commercial purposes such as hotels. The small gardens in the Chiayi museum are neatly landscaped and seem designed to reflect key aspects of the radial prison model via circular hedges juxtaposed with narrow lanes of hedgerows. The unnerving jump from official photo displays to anonymous offender art via empty prison cells and weaponry raises important questions about the art on display at Chiayi. What are the schemes in operation? Where is the art displayed originally and which inmates are selected and encouraged to produce it? Some interesting comparisons might be made with offender art programmes elsewhere such as the Koestler awards which I’ve commented on in previous posts. In particular, we might ask how such art which, whether self-reflexive or not, is often commended as giving inmates both skills and a voice as well as providing a form of therapy, risks deferring any discussions about the wider implications and conditions of incarceration. Where the inmate is reduced to his or her artistic object within the space of Chiayi, elsewhere such art (when attached to seemingly humanizing discourses) is also a way to individualize the prison experience and produce all-too-easy distinctions between those who use their time ‘productively’ and other inmates. Thus, despite appearing to privilege personal narratives of inmates running counter to the pathologization of certain prisoners (see Michelle Brown again here) which are often a highlight of UK and US prison tours with their focus on celebrity inmates, gangsters and mass murderers, offender art is also framed within a discourse which legitimizes the current carceral system and its extension. At the same time, how do we juxtapose endorsed forms of offender self-expression with unauthorized, prohibited forms such as political writings, coded communications between gang members (kites), reading material associated with gang and activist activity, photography and footage taken with smuggled mobile phones etc? How do we avoid fetishizing such forms of self-expression and self-representation and co-opting these within a voyeuristic penal consumerism in order to insist on the power of such objects to tell different stories and produce counter-narratives on the function of incarceration in late capitalism? While the article talks a lot about restoring the ‘spirit’ of the building, it is important to note the way this again remains limited to the material structure of the prison and not the embodied experience of those incarcerated there.